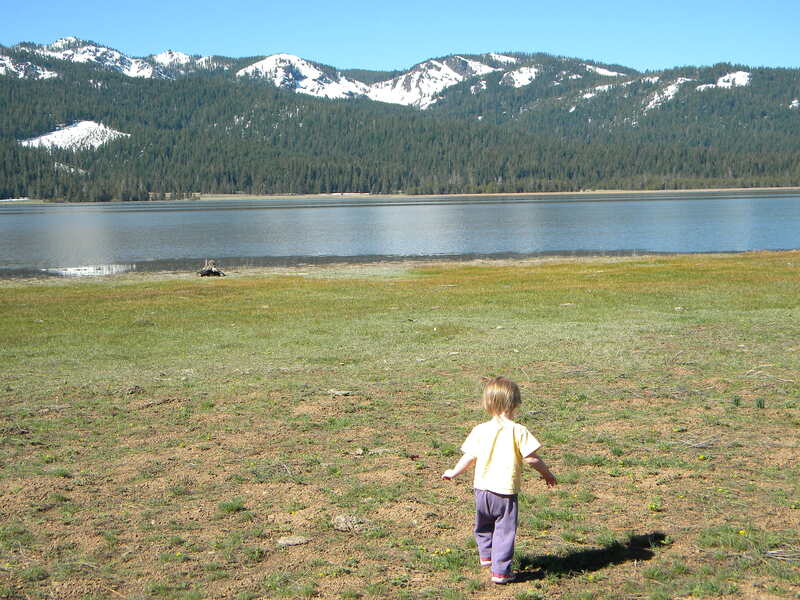 I will be leading a wildflower walk for the Lassen National Forest at Monday, May 20th, at 5 pm at Susanville Ranch Park. See details here. 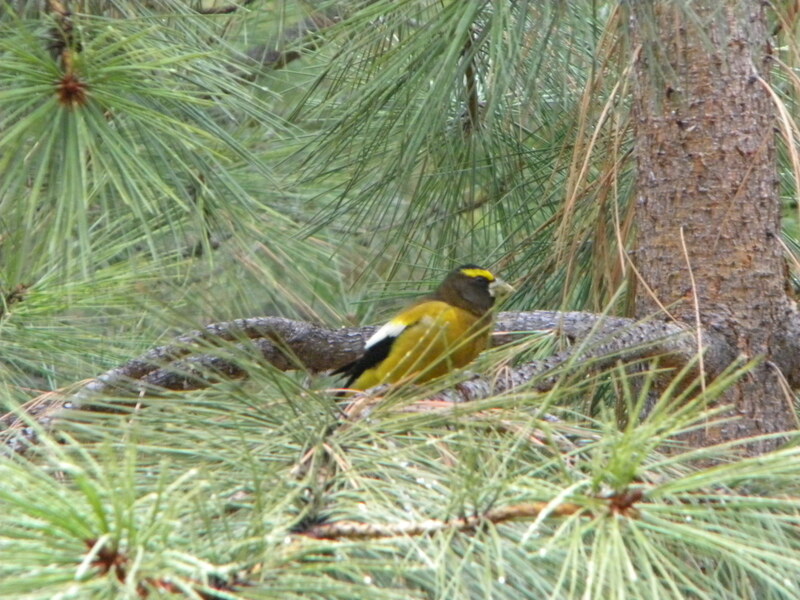 We’ll start at the kiosk near Meadowview School (the large parking area along Lakewood Way), and make our way through several diverse habitats — riparian areas, sagebrush-juniper woodland, and pine-oak forest. 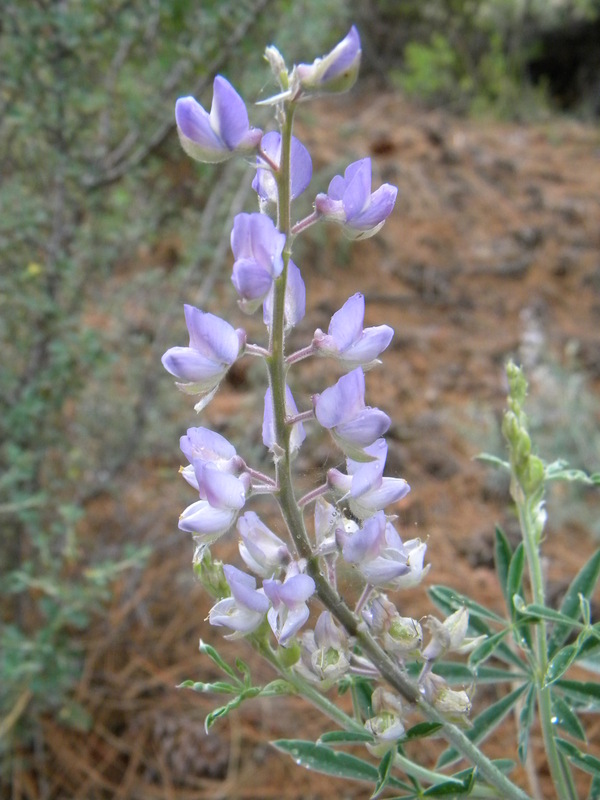 I was out there just yesterday to assess phenology, and saw Lupinus argenteus (silvery lupine, pictured), Delphinium nudicaule (scarlet larkspur), Lomatium dissectum (fern-leaved lomatium), and many other species in bloom. As a botanist, most of my vernal pool trips visits occur after the pools have begun to dry up and rings of flowers begin to bloom at their edges. This is the current, mid-spring condition of many of the Central Valley vernal pools. But up in the mountains, we have a different breed of vernal pool. Our high-elevation pools are underlain by basalt flows instead of clay hardpan, and are filled by snowmelt, not spring rains. These pools are still filled with water, and play host to many species that flourish in this epehmeral aquatic environment. We journeyed out to one such pool two days ago. Later in the season, a Federally Threatened grass species (Orcuttis tenuis) will grow here. But on this trip, we were there to see fairy shrimp. And if my 3-year-old was disappointed that they bore no resemblance to Tinkerbell, she certainly didn’t show it. 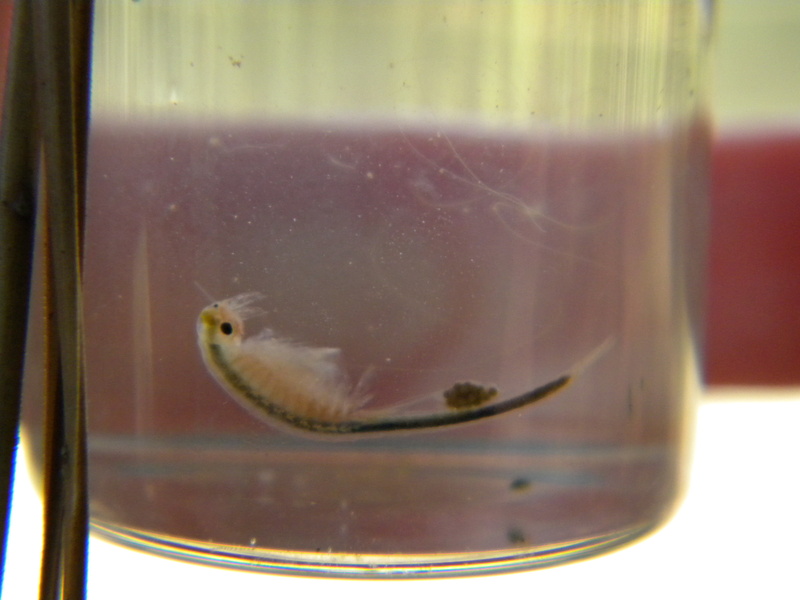 Fairy shrimp are tiny little crustaceaeans (these were less than an inch long) that swim on their backs, and produce eggs encased by a tough cyst (visible on the shrimp pictured). The shrimp will die when the vernal pool dries up, but the cyst will remain dormant for up to a dozen or so years, awaiting the refilling of the pool in a future year before the eggs hatch. As not all vernal pools hold water every year, this is an important adaptation for the fairy shrimp’s survival. 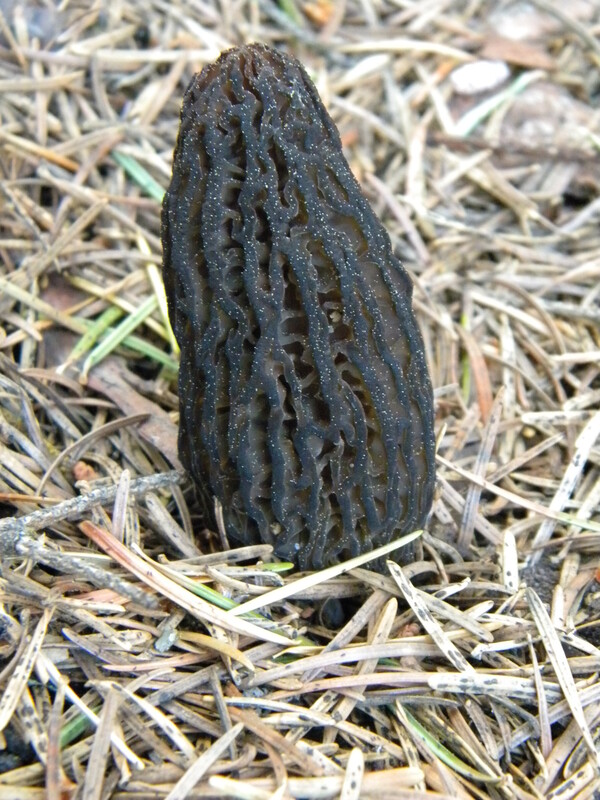 I will not guess at the species we saw — California has over two dozen different taxa. The shrimp were not alone. With net and vial in hand, we also caught and observed Pacific tree frogs, bright red water mites,and a huge predaceaous water beetle (pictured). 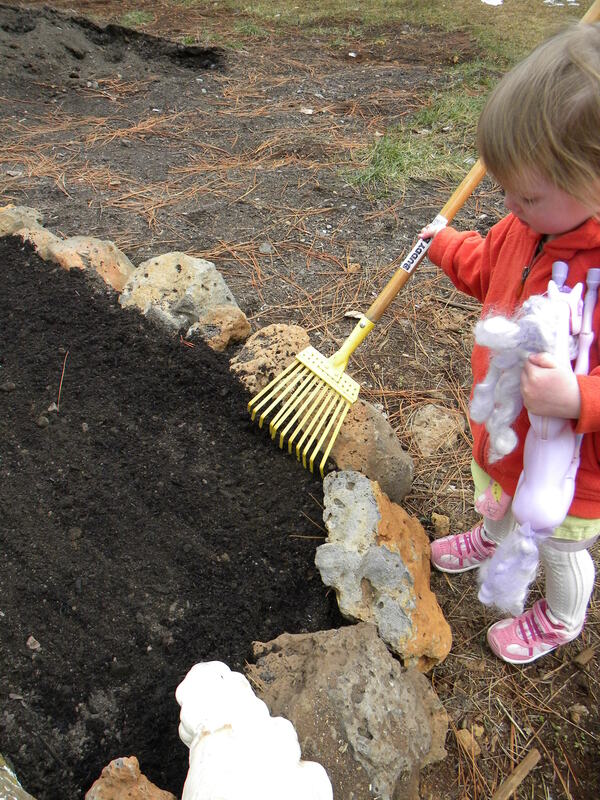 A great way to welcome spring to our mountains and let the girls explore. You would think, that as a botanist, Table Mountain would have been a priority destination when I arrived in California eight years ago. But spring after spring rolled by without a trip to see what many consider to be one of Northern California’s most stunning wildflower displays. Finally, last weekend, we made the journey. North Table Mountain Ecological Reserve perches above the Central Valley on a sprawling basaltic plateau. Table Mountain is peppered with vernal pools and criss-crossed by basalt outcrops and ridges. Grooved swales carry water west, where several end in waterfalls that plunge off the plateau toward the Central Valley below. We walked northwest from the imposing valley oak at the parking lot, and made it to Fern Falls. Not bad for a party that included four babes and preschoolers! Our timing was perfect. Above, A. checks out bright magenta owl’s clover (Castilleja exserta), pale bird’s eye gilia (Gilia tricolor), sunny goldfields (Lasthenia californica), and white and purple sky lupine (Lupinus nanus). Other showy species included Kellogg’s monkeyflower (Mimulus kelloggii), johnnytucks (Triphysaria eriantha), bitterroot (Lewisia rediviva), and yellow carpet (Blennosperma nanum). 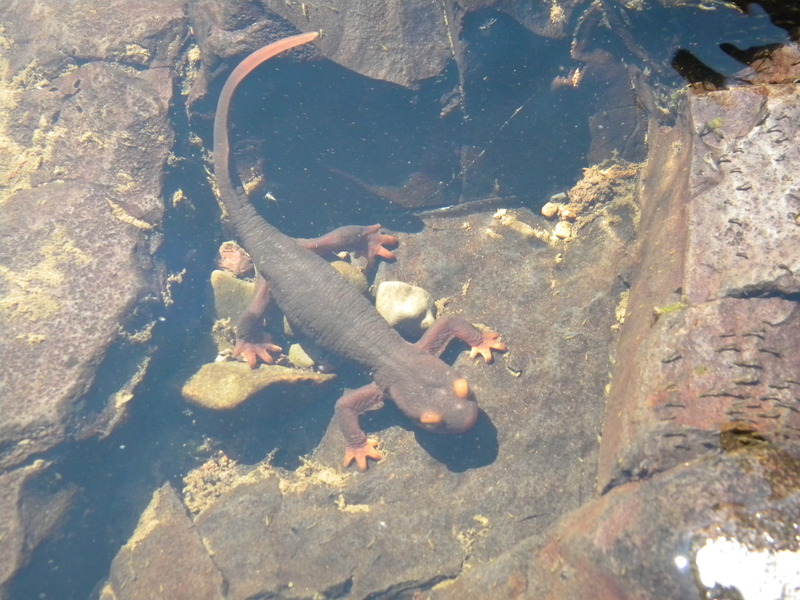 But hands down, the highlight for the girls was this California newt that we found at the top of Fern Falls. I had in hand a book that I purchased at the Chico Farmer’s Market the day before — Wildflowers of Table Mountain: a Naturalist‘s Guide, by Albin Bills and Samantha Mackey. Gorgeous photos, with helpful text on blooming periods and microhabitats found within the reserve. While most of the flowers were familiar to me, the geology was not. I loved the helpful explanations and illustrations that told the story of Table Mountain’s formation in a way that even to a geology layperson like myself could comprehend. M. and I were patrolling the yard for early bloomers when she stooped to peer into this yellow crocus. “A bee!” she cried, and so it was. Its small body was scarcely a centimeter in length, and so encrusted with pollen that it appeared golden. We watched it root around in the nectaries at the base of the flower, then traipse back and forth along the edges of the petals. The girls kept checking in on the bee between other important yard duties (grass twirls, ball kicks, snow eating, etc.). As shadows lengthened, the crocus narrowed its corolla, and still the bee remained. The last we saw before we went inside, our bee was hunkered down in a bivouac of constricted petals. 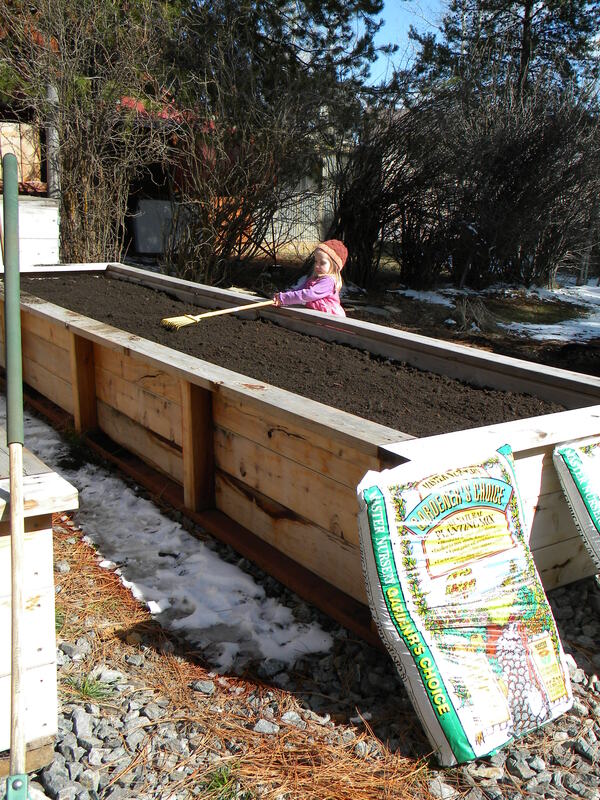 With a few balmy days melting off most of the snow, the garden was impossible to resist. In went the peas, in went the beets, and why stop there, how about some carrots and greens. Too soon? Maybe. But, “Plant early, and plant often,” I was told when I arrived here. 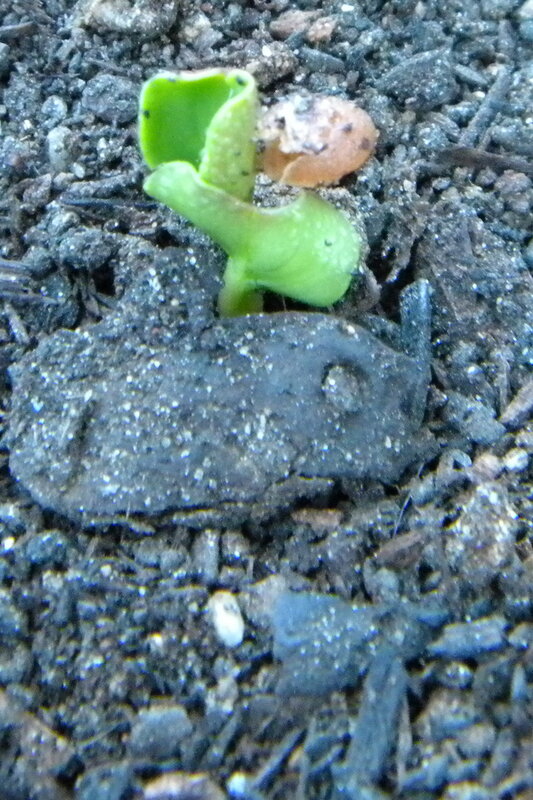 And so we will, should the cold nights of early spring prove too much for our little seeds. 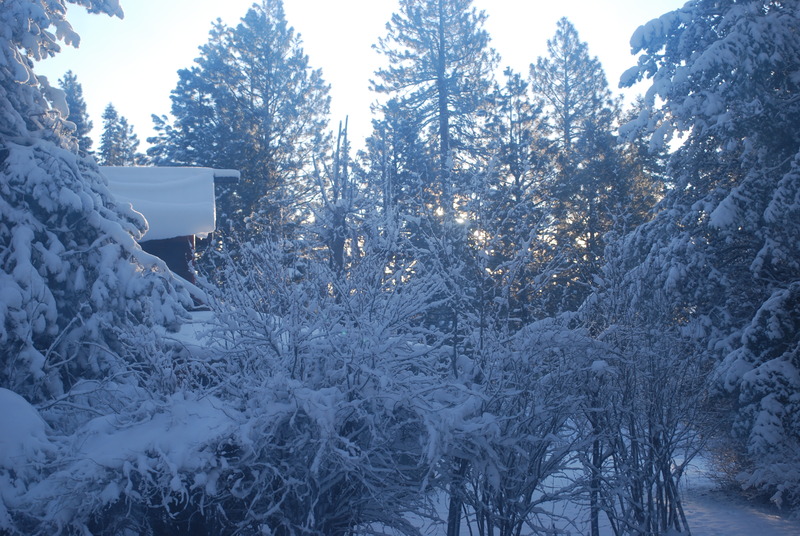 My visiting father took this photo this morning — a clear, crisp dawn tailing a day of spring storms. Normally I am awake well before sunrise, but this morning? Blissfully asleep for a few more hours, thanks to an accommodating husband. Last year our basil was restricted to just one pot. That was, as far as I was concerned, vastly insufficient to meet our growing basil needs. So this year, we are booting other, less favored herbs from the windowsill and planting four pots of basil and two pots of parsley. Basil is rarely happy planted out of doors up here, and parsley takes so long to germinate that it seems best suited for our indoor garden as well. The girls and I planted these pots two days ago. 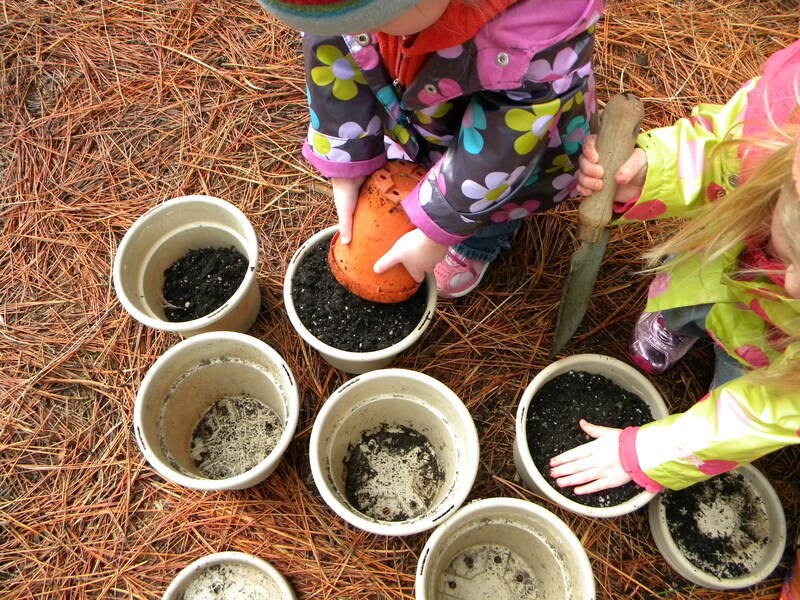 M. conscientiously scooped trowels of potting soil into our pots, observing, “It’s just like filling up muffin pans, isn’t it?” And A. is no longer an observer but a participant in all that we do outdoors. 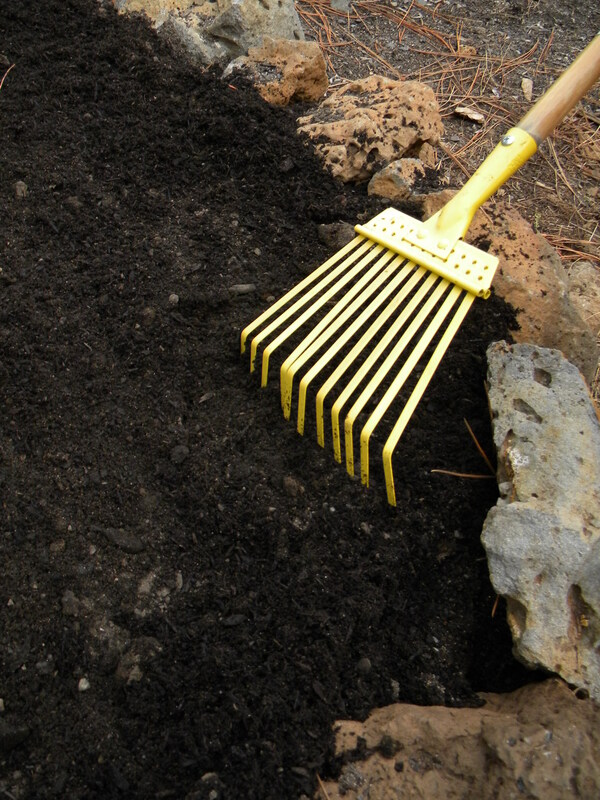 She enthusiastically piled scoop after heaping scoop of soil of soil into already-full pots. Then M., who has always had a well-developed little pincer grasp, took those tiny little basil seeds and carefully placed them across the surface of each pot. 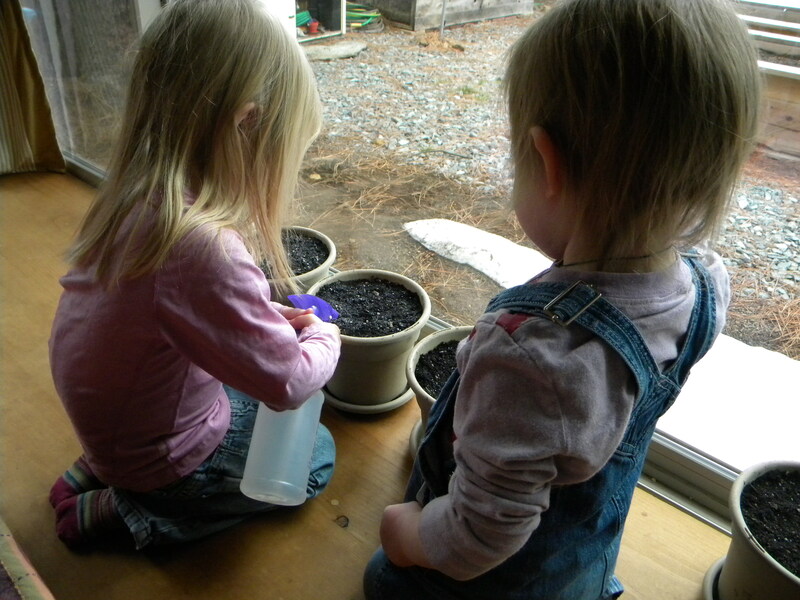 We brought them indoors, and M. showed A. how we water. 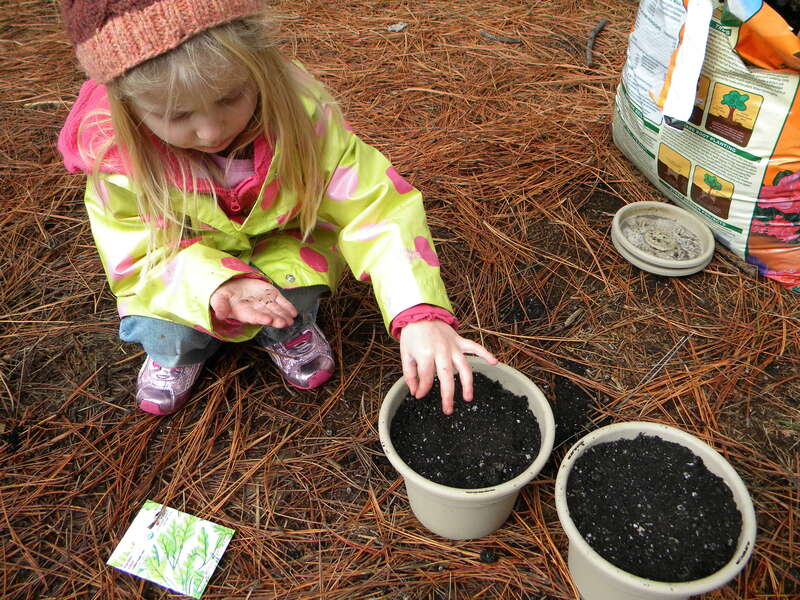 She decided that they should each have three pots to tend, and so it has been as we water and watch each day.